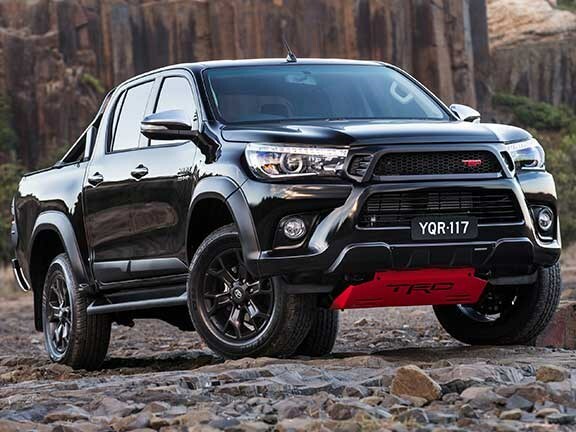 Toyota has created what it says is the ‘boldest, most aggressive-looking production HiLux yet’ with the addition of a components package from Toyota Racing Development (TRD). There are 15 new components on the updated HiLux ute, with seven of those coming from the TRD division. The package is only available for the top-of-the-line HiLux SR5 double cab, which has leather-accented trim and comes in either black or white exterior paint. The updated parts include a red TRD-branded skid plate, which contrasts against the new black TRD grille, TRD lower bumper cover and TRD fender flares. Black is a big theme on the updated HiLux with matte black 18-inch six-spoke alloy wheels and a black sports bar, along with black mouldings along the body side and leading edge of the bonnet. At the rear of the ute, a towing kit (tongue, ball and wiring harness), ute liner, a soft tonneau cover, taillight covers and TRD mudflaps complete the exterior makeover. Inside, Toyota has added TRD carpet floor mats and a TRD gear knob for automatic variants. This comes on top of the standard features found on the HiLux SR5 such as the 130kW 2.9-litre turbo-diesel engine capable of pushing out 450Nm of torque, plus cruise control, satnav, Bluetooth audio and climate-control air-conditioning. "Local buyers voted with their wallets to make HiLux the best-selling vehicle in Australia last year," Toyota Australia sales executive director Tony Cramb says. "And the majority clearly indicated their preference for upmarket features combined with HiLux's renowned go-anywhere capability. "We have responded to that demand by compiling premium components, including the respected TRD brand, that will further distinguish HiLux from the competitors and from every other HiLux in our range," Cramb adds.